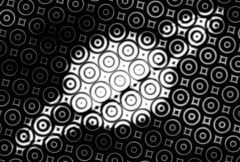 Generates a duotone version of the source clip using a repeating pattern of concentric rings. Use the Smooth Source parameter to remove some details and make the dots more consistently shaped. Center: Popup menu, Default: Black . Selects the rings' color model. Black: dark rings are used on a bright background. White: bright rings are used on a dark background. Rings Frequency: Default: 20, Range: 0 or greater. The frequency of the overall rings pattern. Increase for smaller rings, decrease for larger rings. Rings Angle: Default: 30, Range: any. The angle of the overall rings pattern, in degrees. Rings Rel Width: Default: 1, Range: 0.01 or greater. The relative width of the rings. Increase for wider rings, decrease for taller ones. Rings Sharpness: Default: 2, Range: -1 or greater. Scales the sharpness of the edges of the rings. Rings Lighten: Default: 0, Range: any. Increase to lighten the resulting rings pattern. Ring Number: Default: 2, Range: 1 or greater. Determines the number of concentric rings in each tile of the repeating pattern. Ring Phase: Default: 0, Range: any. Shifts the rings in or out within each tile of the pattern. The 'bright' color to use for the dots pattern. The 'dark' color to use for the dots pattern. Rings Shift: X & Y, Default: [0 0], Range: any.